She is also working on a book of nursery rhymes- she has been working on it for 2 years and thinks it will be another 2 years before it is finished. She showed me pages and pages of her beautiful work. It is truly inspirational. I picked her brain about card making and selling and also about book publishing. All so interesting. And, Theresa, she has your magnet on her fridge! desk photos- I love to see how people work! This entry was posted in General, inspiration by mimik. Bookmark the permalink. Lucky you! I’ve been a fan of Salley’s ever since the 80s (70s??) 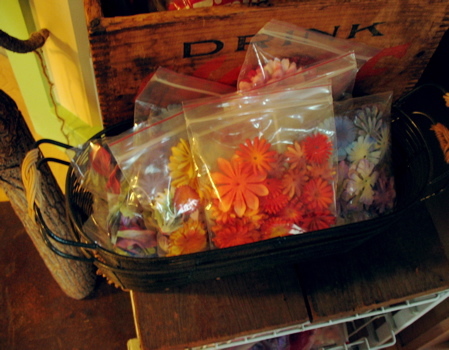 when she was selling little pins from a precious handmade catalog (which I still own, as well as a wee house pin.) I had initially read about her in a small blurb in the Boston Globe Sunday magazine. Thanks for sharing. It looks wonderful in her studio. Can you believe I was making that style of doll for 2yrs before I even heard of her? In retrospect that just seems bizarre to me. What rock was I living under? I adore her work! Thanks for the peek into her work space. 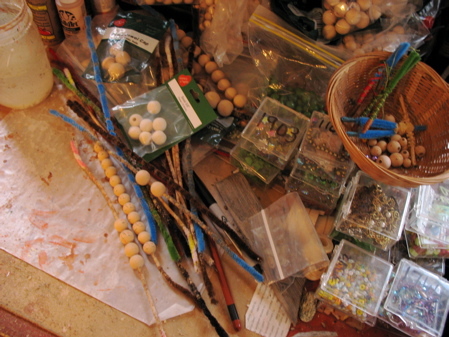 I wonder if her embroidery floss stash is as crazy as mine! Oh wow those are lovely little dolls. Looks like you had a great time with your friend. wow! i’m stunned. i had NO idea you two were pals. you have probably guessed by now i am a HUGE Salley fan. and i’m thrilled to hear she’s working on another book…one more for my collection :). 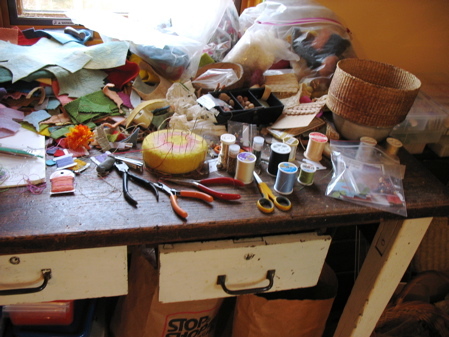 great shots of her studio…i’m always curious to see the creative process. 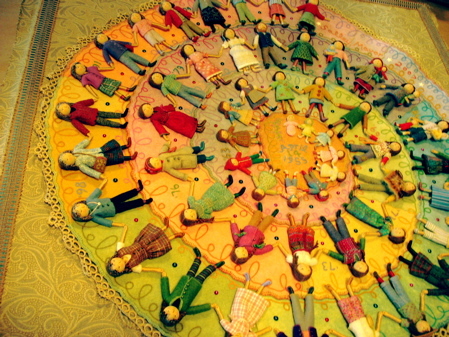 Love The Wee Felt Folk it must have been awesome to see work in progress so to speak.